How do I get Facebook Timeline back? I had to remove Facebook Timeline, now how do I get it back? Your friends will be retained. I'm using safari, on my mac. I downloaded the timeline remover app and cant find the add on in my tools or anything.. How do I get facebook timeline back? I'm a strokes survivor and I don't feel missing in facebook.Please help fix my fb in timeline so I won't do a lot of comments just click likes and send my private messages to my family and my close buddies. Thank you for helping fix timeline in facebook. i need my old facebook profile, want to remove timeline how i can ? Please help me use timeline so I can send all my friends in facebook. I get my chest very tight having me problems to send thank you to all my birthday greetings. Please help me. can i get my timeline back i miss it ? Yes, cos Facebook Timeline is permanent and cannot be reverted. Every solution i’ve seen online is simply a browser trick that makes one’s profile look like the old profile. All the same i think i prefer the timeline…. So why’ll i wanna revert? how can i get back my facebook timeline after i cancel it.. Please refer to my many comments above. If none of them help, please try me again with a more specific question. Thank you! I use IE9, accidently installed two "anti" timeline apps and did not activate timeline on this account yet. My idea was after TL disappeared to de-install the 2 apps but unfortunately TL (option in this case) did not resurface and I'm not able to download it from the FB introduction page (soon available notification). The names I forgot too because they got there by accident and were there very short ... one of them was "Get Rid Off ...."
Hope you can help because I don't know exactly what caused it. I use IE9 and without really realizing it installed two "anti" timeline apps, which (I thought) after de-installing did not have the desired effect .... TL back on my page. One was Get Rid off I believe and the other one I really forgot. On top of that I did not even start the TL function yet .. although I had the option. The options are gone and I'm not able to get it again via the intro site of FB .. it just says: available soon. Did you ever see the Timeline? Timeline should have been forced on all Facebook accounts by now, so I find it strange that it would say 'available soon' on your profile. When you log into Facebook using another browser or computer, what do you see? Do you know where to see all your IE extensions and did you check all of them? How did you uninstall those other extensions? Did you check your installed Windows software? If nothing works and if you see the Timeline fine with another browser or on another computer, I would recommend uninstalling and re-installing IE. 1. I don't see "available soon" in my profile bit at the intro TL page of FB. 2. I'll try that one ... didn't think of that. 3. No, I don't know that in IE. 4. Via the uninstall poss. in FB. 6. Same answer as 2. I will try that and come back on that one. I have a little extra info which might help .. or make it even more strange .. don't know. Somehow FB thinks I still have TL although I lost all functionality ... may'be nr.2. & 6. are therefore the right way to check this. Thanks for the other approach and I'll let you know. Like I said, for FB I still have TL but I, for instance, can not make a big profile picture and don't see the TL to the right of the page. I'm at my wit's end, then. As far as I know there is no Facebook app that can disable Timeline, but if you don't see your Timeline on different computers and browser, then that is the only explanation left that I can think of. Please refer to my comments above! How did you remove the Timeline? With your answers, you will also find instructions to recover your Timeline above. Good luck! i switched my fb timeline to wall view by using the timeline remove and now i can't access my timeline neither other contacts timelines all i get is a white page please how can i get my timeline back and resolve this problem ? Did you try the suggestions above on how to uninstall a browser extension? It depends on what browser you are using. You will find instructions for Chrome and Firefox in the comment above. Good luck! How did you remove it? Did you check the other comments in this thread for solutions? till last week i used timeline only. but due to some reason i changed to old profile. :( So now How to get back to timeline again from my old profile? How did you disable it. Please also read the other comments in this thread for possible solutions. To help you we need to know how you removed Timeline and what browser you are using. i removed my timeline, and now i want to get it back.. what shall i do ?! How did you remove your Timeline? What browser are you using? ..so how will I put it back? if you are a chrome user go to settings and then to the extension tab. deselect the enable checkbox for SocialReviver (The way YOU want Facebook to be!). How did you remove the Timeline for your old account? Did you maybe use a browser add-on that now also affects your new account? Log into your account on a different computer or browser and see what it looks like. If you see the Timeline, then it's just your browser. If not, it must be a program running on your PC. For as much as I know, there are no accounts without Timeline anymore, unless removed locally, i.e. on your computer with software. What is a stuffy? Can you please explain? On what browser did you install Timeline Remover? Safari or Chrome? Sorry I cannot be of more help, I'm not using Safari. I'm not sure about TimeLine Remover V2. It sounds like it's a third party application, not an individual browser plugin. Did you try to go through Add/Remove Programs in Windows to see whether you can uninstall it there? i wan get facebook timeline back!! Read through the comments above, lots of advice and potential solutions in there already. Good luck! I had to remove my Facebook Timeline and now how do i get it back ? How you get your Timeline back depends on how you removed it and which browser you are using. Since you didn't say, I can't really help you. However, I suspect that the answer is already here. Please scroll through the entire comment thread to find your answer. I used google chrome to download a timeline hider, but not timeline remover. This only works on my computer for i see everyone's profile like the old facebook used to be. I still have timeline but i want to disable the download that i use to hide timeline. Will someone please instruct me how to do so. Tanks in advance! Can you be more specific as to which Timeline hider you used? Is that the name of the app? Was it a Google Chrome browser plugin or did you install it on your computer? You can check quickly by opening Facebook in another browser. If the Timeline is disabled there as well, it's probably not just a browser plugin. What operating system do you have? How did you disable it? What browser are you using? How do i get my timeline back????? by using chrome????????????? How did you remove the Timeline? Did you use a Chrome browser extension? Check whether there is anything like Timeline Remove. Disable or remove the respective extension. Now your Facebook Timeline should be back. Do let us know if this worked! Well mine removed without my will and i don't have any "timeline remove" or whatever in my chrome settings. could it be facebook? It would help to know how you removed it. Which browser are you using? Look into your browser extensions / add-ons and disable the one you used to remove the Timeline. That should do it. How did you remove it in the first place? What browser are you using? one day I went on facebook and its gone instead someone wrote on my timeline its someone wrote on my wall and how do I get.my cover photo back? Which browser are you using? Did you try another browser to see whether you profile looks the same there? can i get back my facebook timeline by using firefox?? You can only remove the Timeline with browser add-ons / extensions. So if you used one of these on say Internet Explorer, then opening Facebook in Firefox should let you view the Timeline. Instead, you can just get rid of the respective browser extension and view Facebook with the Timeline in your default browser. How did you remove it? Just undo these changes. You probably used a browser extension. Just remove that and the Timeline should be back. Well, how did you remove it? Just undo the changes, i.e. uninstall the browser extension you probably used. Reverse the changes that removed it. You probably used a browser extension, so disable or uninstall that. iam using chrome, and yes, i installed the timeline removal , dumb. wrong choice, now i need timeline back, someone please help me? i am using firefox,how can i get my timeline back? How did you get the Timeline removed in Firefox? Simply reverse your changes! If you installed an extension to remove the Timeline, go to > Firefox > Add-ons, find the respective extension and > Disable or > Remove it. If you used a Greasemonkey script, you don't have to disable or remove the entire extension, you can remove the respective script. This should be possible by managing the extension. http://www.facebook.com/about/timeline and click Get Timeline. For timeline remover : find the icons of the addon and click them to switch between wall and timeline. refresh to see your timeline. can you please tell me where is the "addon" button? what did you use to remove the Facebook Timeline and for which browser? If you used TimeLine Remove addon in Chrome, you should see the respective button in the top right (http://www.timelineremove.com/images/h_IT.png). Click the button and switch between wall and timeline view. 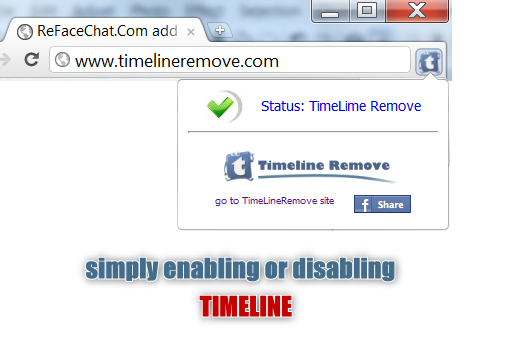 If you no longer need to switch, but want to stick with timeline, you can also uninstall the respective browser addon. Enable the addon and check your Facebook account.Enable timeline with that addon and logout and login with Facebook. This might help you recover your account to its previos state. I had timeline and about 2 hrs. ago it went back to the old Facebook, I want to know why it did it and how can I get it back? I want my timeline back and like the way it was!!!!! Please help!!!! If you have removed your timeline with the "Facebook Timeline Remover" App that is on Facebook, you can easily change your profile from the old version back to timeline. 1) Go to your Facebook page. 2) Look at the far right top corner, there is a small tab to access the account settings, the log-out button, etc. 3) Note the last option is: "Enable Timeline" - if you click that, it will change to "Disable Timeline"
i did that to its enable now but when i log out and log back in i have to enable it again why wont it just stay enable ?